Sometimes, pictures really are worth a thousand words. 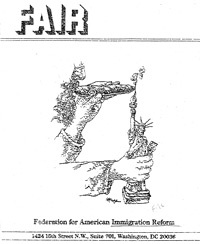 In the 1980s, the Federation for American Immigration Reform (FAIR) — a restrictionist group that insists it is not bigoted despite a small mountain of evidence to the contrary — put out an untitled, undated booklet of cartoons that featured on the cover what looks like Fidel Castro strangling the Statue of Liberty and lighting his cigar in the flaming torch she holds. 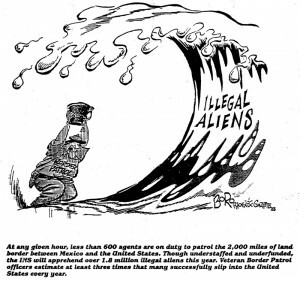 Not surprisingly, given FAIR’s track record of demonizing immigrants, the group’s pamphlet is filled with provocative drawings by professional cartoonists that are accompanied by often bigoted or defamatory subtitles written by FAIR. 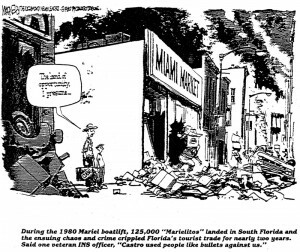 FAIR’s commentary is particularly vicious when discussing refugees who arrived in South Florida from Cuba during the 1980 Mariel boatlift. 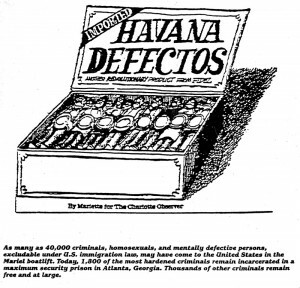 In the graphic below, FAIR presents the Marielitos as “Havana Defectos” and described them as “40,000 criminals, homosexuals, and mentally defective persons,” a phrase that is remarkably similar to the Nazis’ descriptions of their own enemies. This isn’t the first time we’ve seen this kind of thing from FAIR. In 1990, a board member of FAIR’s legal arm used nearly identical language to describe the Marielitos. Here, Miami is depicted as looted and destroyed by the Marielitos. In the accompanying commentary, FAIR blames the Cubans for causing “chaos and crime” that “crippled Florida’s tourist trade.” But the reality is that only about 2%, or 2,746, of the 125,000 refugees were ultimately determined to be serious or violent criminals. Large numbers, in fact, were simply people who disagreed with aspects of the Castro regime. 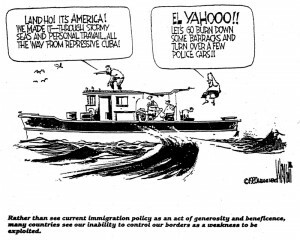 Economist David Carr also found that the boatlift entailed no negative effect on wages for any groups in Miami. Other parts of FAIR’s booklet portray undocumented immigrants as a tidal waving swamping the U.S. or as mooches on the system who siphon up social services. This depiction comes regardless of the fact that most economic studies have found a net economic benefit to the U.S. from immigration. 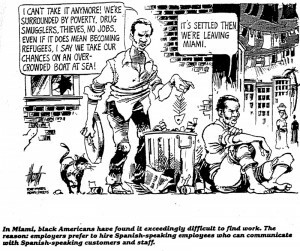 In another cartoon, FAIR makes the claim that Spanish-speakers are destroying economic opportunity for black Miamians. “Employers prefer to hire Spanish-speaking employees who can communicate with Spanish-speaking customers,” FAIR alleges. Sowing discord between minority groups is a tactic FAIR has used more than once. At one point, FAIR even organized a fake front group called Choose Black America (CBA) that supposedly represented blacks concerned about immigration. FAIR paid for CBA’s “members” to attend their first — and only — press conference and the group’s spokesman was a white employee of FAIR. The group quickly fell apart and is now defunct. 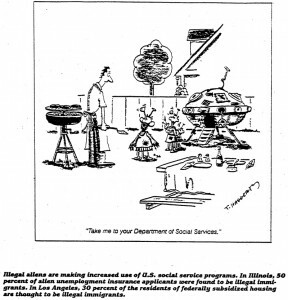 The pamphlet ends with a cartoon that suggests the U.S. will be inundated with life forms from throughout the universe — a graphic that more or less sums up the intensely xenophobic, bigoted ideas that animate America’s largest and most powerful nativist organization.